The Fogg Museum, located five miles from Boston, is part of the Harvard Art Museums, alongside the Busch-Reisinger Museum and the Arthur M. Sackler Museum. It is the oldest of Harvard University’s art museums, having opened its doors to the public in 1896. Currently only selected works from the Fogg Museum are on display at the Arthur M. Sackler Museum due a major renovation and construction project. Scheduled for completion by 2015, the project's aim is to house all three of Harvard's museums in one sophisticated facility, including dedicated gallery space for use by the Harvard University faculty and students. The Museum is named after William Hayes Fogg, a successful Maine merchant who died in 1884. Fogg had grown wealthy by trading out of China, and together with his wife Elizabeth, they amassed a sizeable Asian art collection. Elizabeth went on to leave the art collection to Harvard, along with a $200,000 legacy. An Italian Renaissance style building, built in 1893 and known as Hunt Hall after its designer, Richard Morris Hunt, was the original home of the Fogg Museum. The Museum was moved to 32 Quincy Street in 1925 to a Georgian Revival style building designed by Coolidge, Shepley, Bulfinch and Abbott, and Hunt Hall was later demolished in favor of new dormitories for students. The Fogg Museum's body of works has increased substantially over the years, and is famous for its collections of Western paintings, sculptures, photographs and prints, decorative arts, and drawings from as far back as the Middle Ages through the present day. The Italian Renaissance period, 19th century French art, British Pre-Raphaelite period, and paintings and drawings from 19th and 20th century America are strongly represented. Many famous French Impressionist and post-Impressionist masterpieces can be seen at the Fogg Museum as part of the Maurice Wertheim Collection, including Still Life with Apples, a Pear, and a Ceramic Portrait Jug by Paul Gauguin (1889). Other artists such as Pablo Picasso, Vincent van Gogh, Henri Matisse, Edgar Degas, Edouard Manet and Paul Cezanne are also represented. 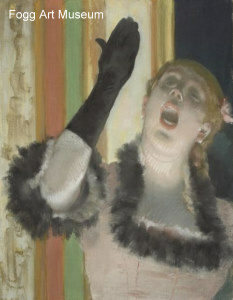 The Grenville L. Winthrop Collection contains over 4,000 works of art, including some important 19th century sculptures, drawings and paintings by artists such as William Blake, Winslow Homer, Auguste Rodin, Edward Burne-Jones, Honore Daumier, Jacques-Louis David, John Singer Sargent, James Abbott McNeill Whistler, Jean Auguste Dominique Ingres and Henri de Toulouse-Lautrec. A central part of the Fogg Museum, the Collection serves as a foundation for professional training programs, research and teaching and is pivotal in shaping the legacy of the Harvard Art Museums. Other works of note include Edgar Degas’ 1878 painting, The Singer with the Glove, and John Singer Sargent’s 1888 self-portrait dedicated to Paul Gauguin. The Harvard Art Museum has an online search facility through which 250,000 works of art can be accessed, including many of the works from the Fogg Museum.